The scientific readings, named after professor Ye.T. Skliarenko, “Implementation of scientific developments into health care practice”, were held on 22, December, 2017 on the base of National Military Medical Clinical Center “Chief Military Clinical Hospital” at Ministry of Defense of Ukraine. The event was organized by O.O. Bogomolets National Medical University at MH of Ukraine together with State Establishment “Institute of Traumatology and Orthopedics at NAMS of Ukraine” and all-Ukrainian Public Organization “Association of Orthopedists- Traumatologists of Ukraine”. 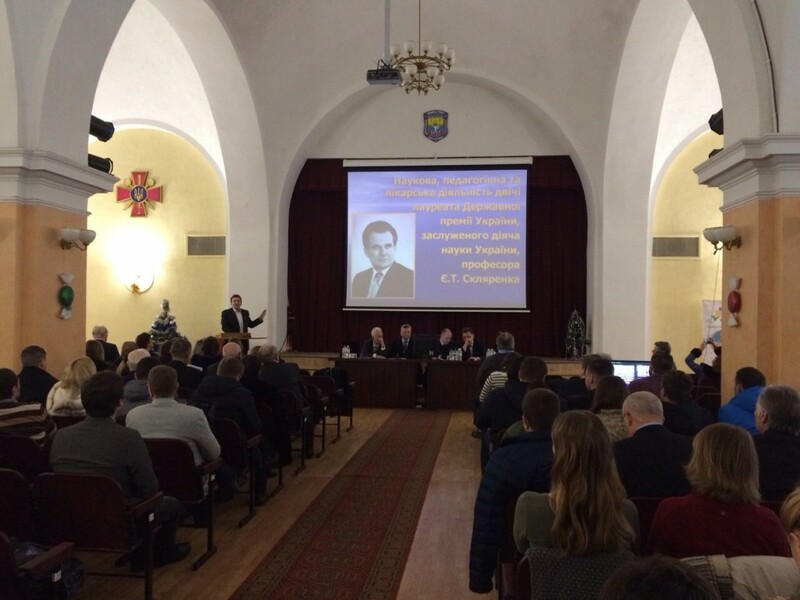 The session this year was devoted to the memory of Ukrainian scientist, laureate of State Prize of Ukraine, Honorary Scientist of Ukraine, Doctor of Medicine, Honorary Professor at department of traumatology and orthopedics at O.O. Bogomolets National Medical University Skliarenko Yevhen Tymofiiovych. The president in NAMS of Ukraine Vitalii Tsymbaliuk, director in SE “Institute of Traumatology and Orthopedics at NAMS of Ukraine”, academician in NAMS of Ukraine, professor Heorhii Haiko, pro-rector in scientific pedagogical, treatment activity and postgraduate education, professor Oleksandr Naumenko, head at National Military Medical Clinical Center “Chief Military Clinical Hospital” at Ministry of Defense of Ukraine, general-major of medical service Anatolii Kazmirchuk, deputy director in scientific activity at SE “Institute of Traumatology and Orthopedics at NAMS of Ukraine”, professor Serhii Strafun. Vice-president in all-Ukrainian Public Organization “Association of Orthopedists- Traumatologists of Ukraine”., Honorary Scientist and Technologist of Ukraine, head at department of traumatology and orthopedics at O.O. Bogomolets National Medical University, Doctor of Medicine, professor Oleksandr Burianov made the introductory speeches to participants. The urgent problems in rendering the medical aid to patients with orthopedic trauma, the most significant scientific achievements of orthopedic traumatological profile pursuant to evidence-based medicine. The scientific practical session was held in the format of plenary meetings. Over 280 attendants from many regions of our state and abroad took part in the conference. Over 24 reports and lectures were presented; more than 53 stand reports were demonstrated. The report by Yurii Vilenskyi and Issak Trachtenberg about scientific, pedagogical, medical way of twice laureate of State Prize of Ukraine, Honorary Scientist and Technologist of UkrSSR Skliarenko Yevhen Tymofiiovych was interesting and rich in content. The plenary meeting with awarding the personal academician O.O. Korzh and professor Ye.T. Skliarenko scholarship was also held within the conference. The scientific projects by young scientists in the sphere of orthopedics and traumatology were considered. The laureates of this scholarship were the resident medical practitioner at department of orthopedics and traumatology at O.O. Bogomolets NMU Myroslav Vakulych and employee of SE “Institute of Traumatology and Orthopedics at NAMS of Ukraine” Andrii Lysak. The materials of the conference were published in occupational scientific practical journal “Chronicle of traumatology and orthopedics” No 1-2, edition of 2017.